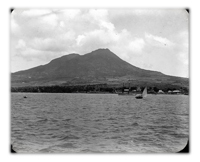 Nevis had become a familiar navigational mark for sailors entering the Leeward Islands in the Caribbean and was used as a stopover point for English sailors like Bartholomew Gilbert en route to search if there were survivors of the Roanoke colony and Captain John Smith on his way to Virginia in 1607. Dutch, French and Spanish sailors were all familiar with the distinctive size and shape of the island also and some stopped off for provisions, repairs and supplies at times. 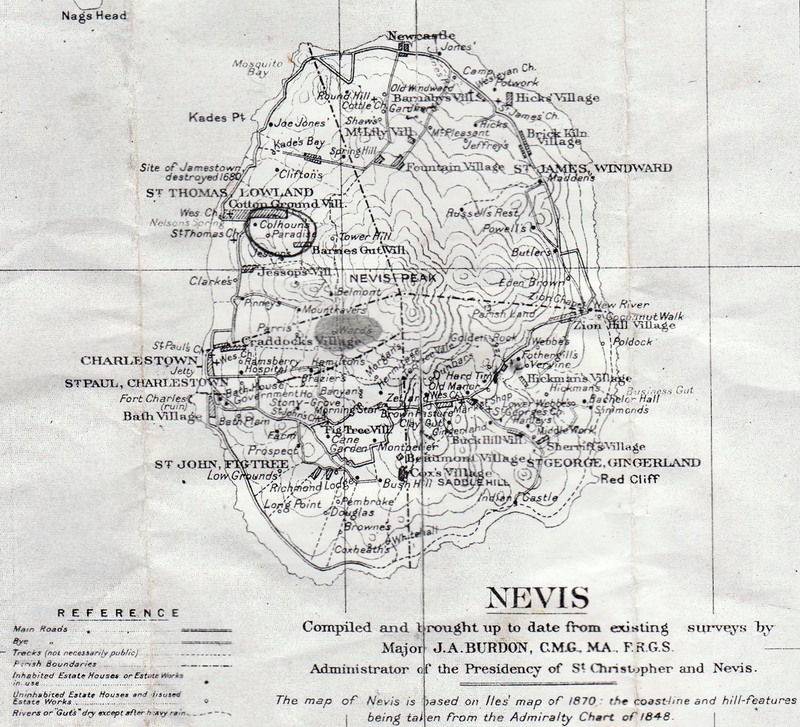 Nevis actually became part of the first English foothold formally granted in what had hitherto been regarded as the Spanish Caribbean. The person to receive the Letters Patent from King Charles I in 1625 was Sir Thomas Warner. Warner had established himself on the neighbouring island of St. Christopher the year before where he had built up a small community of Europeans growing maize and tobacco. 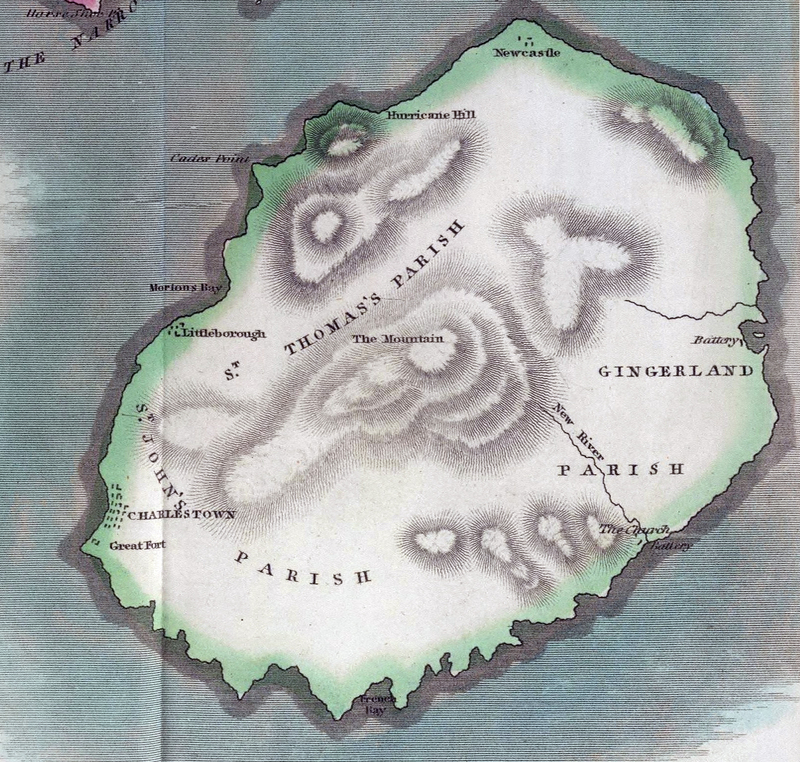 It was on the basis of the success of this early plantation that the newly crowned King Charles I granted Sir Thomas Warner his claim to not only St. Christopher but also to Nevis, Montserrat and Barbados. Warner surrendered his letters patent to these islands to the Earl of Carlisle in 1627 but continued for the new 'owner' as governor who had much deeper pockets and was ambitious to see European expansion in his newly acquired islands. 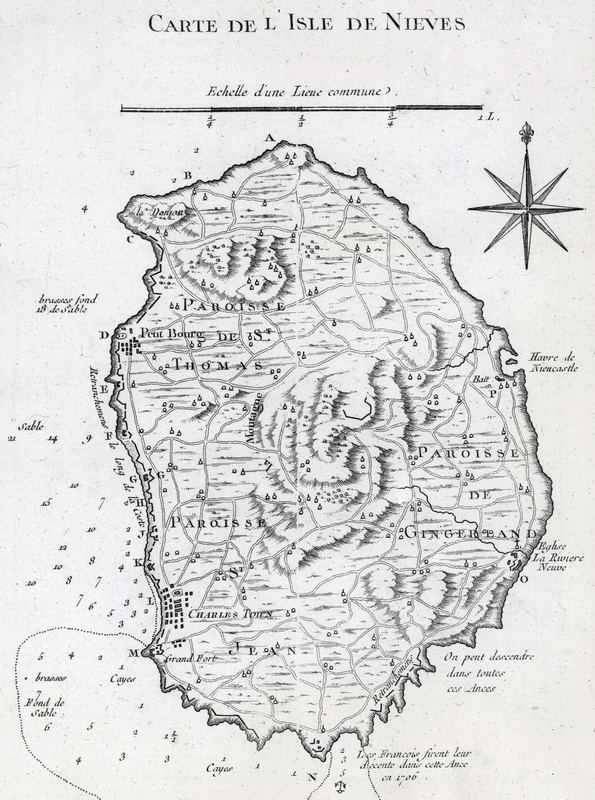 The first European settlement on the island of Nevis came in 1628 when Captain Anthony Hilton was appointed governor by Sir Thomas Warner and tasked with establishing new plantations with 80 settlers from St Christopher. These were to be joined by 100 addtional settlers shortly afterwards who had been on course for Barbuda but decided to remain on the fertile island of Nevis instead. They attempted to grow tobacco, cotton and maize. A steady trickle of European labour was provided over the following decades through indentured slaves being sent out from the poor and destitute of England. These typically served a pre-determined sentence and were freed upon its completion - although they were not given return passage to England. Spanish attempts to reassert their control in the region came to a head in 1629 when Admiral Fadrique de Toledo dropped anchor at the island and captured or destroyed the English ships in harbour before going ashore destroying the nascent settlement and capturing many, but not all, of the English settlers and forcibly deporting them back to England as per the surrender document. The following year saw the end of the five year long Anglo-Spanish war and Nevis (along with St. Kitts) was returned to English control as part of the settlement. The fundamental transformation in the plantation economy occurred in the 1630s and 1640s when Dutch settlers from Brazil introduced sugar cane to some of their island colonies in the Caribbean. Hitherto, tobacco had been profitable enough although the high temperatures and occasional hurricane winds could damage the frail crops. Sugar cane was far hardier and the prices that it could command back in Europe would be truly transformative for the island economies. However, these sugar cane plantations required labour and investment on a large scale. This meant that European small holders were to be crowded out as richer landowners expanded their holdings, built the necessary kilns and infrastructure and began importing and using slave labour. By the 1650s, sugar had replaced tobacco as the main crop and Africans already made up 20% of the population. This percentage would only increase as the insatiable demand for sugar back in Europe meant that within a further two decades the black population outnumbered the white population on the island and by the turn of the 18th century, black Africans represented over 80% of the population. As the ratio of slaves increased, so did the harshness of the measures to keep the reluctant workforce in their place and to help maximise the work that were forced to do. The slave economy had been born. Initially, it had not been unusual at this time to see English indentured servants working side by side in the plantations with black African slaves. However, the English indentured servants tended to have fixed sentences and were freed after a period of time, typically seven years. African slaves were bought to serve for the rest of their lives. In 1650 an African slave could be bought for as little as 7 pounds. In comparison, a white indentured labourer or servant would cost a planter 10 pounds for only a few years' work but would cost exactly the same in food, shelter and clothing. Consequently, after 1660 very few new white servants reached Nevis as black Africans took their place. The freed indentured slaves either became overseers or worked for absentee plantation owners or more often than not, travelled on to one of the 13 American colonies to seek land and opportunities for themselves there. (One of the most famous sons of Nevis was to be Alexander Hamilton who went on to become one of the key founding fathers of the United States in the Eighteenth Century). Some of the freed whites joined passing ships and became bucaneers and privateers as the religious wars of Europe spilled out into the seas of the Caribbean and frequent warfare gave opportunities for plunder. Some black slaves were able to escape and headed for the forested highlands. These were known as maroons. Although at first hesitant to live side by side with the native Caribs, over time trust was built up between the groups united by their mistrust of the European power and technology along the coastline. They survived by using their wits to steal or manufacture equipment and weapons and foraged or carved out smallholdings deep in the forest. 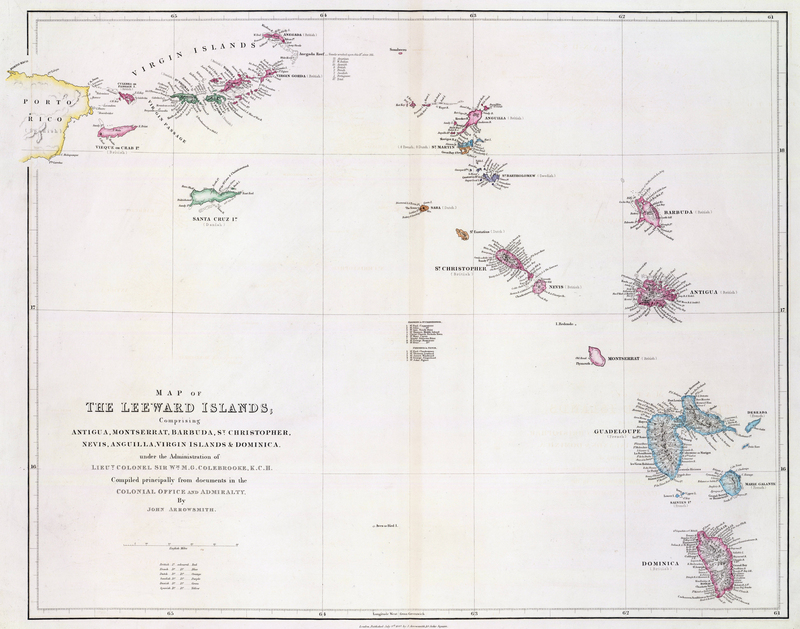 In 1671, the Leeward Islands were administratively separated from Barbados and Nevis became the seat of administration for what became known as the Leeward Islands Colony. It was given nickname "Queen of the Caribees". For a time, it became the most profitable of all the sugar islands in the British Empire. The fertile land and ideal climate made the island produce the highest concentrate of sugar from the cane of all the sugar producing islands. 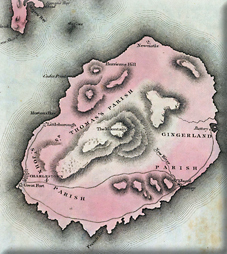 By 1700, the tiny island was producing 20 per cent of the entire sugar production of the British West Indies. It was also the centre of the British slave trade in the Caribbean and acted as something of a hub to the other islands for the importation and onward transportation of slaves from Africa. In 1698, the seat of the Leeward Islands colony was moved once more to Antigua on the basis that it made a better base for naval ships and was regarded as a gateway island that would be the first to be attacked. 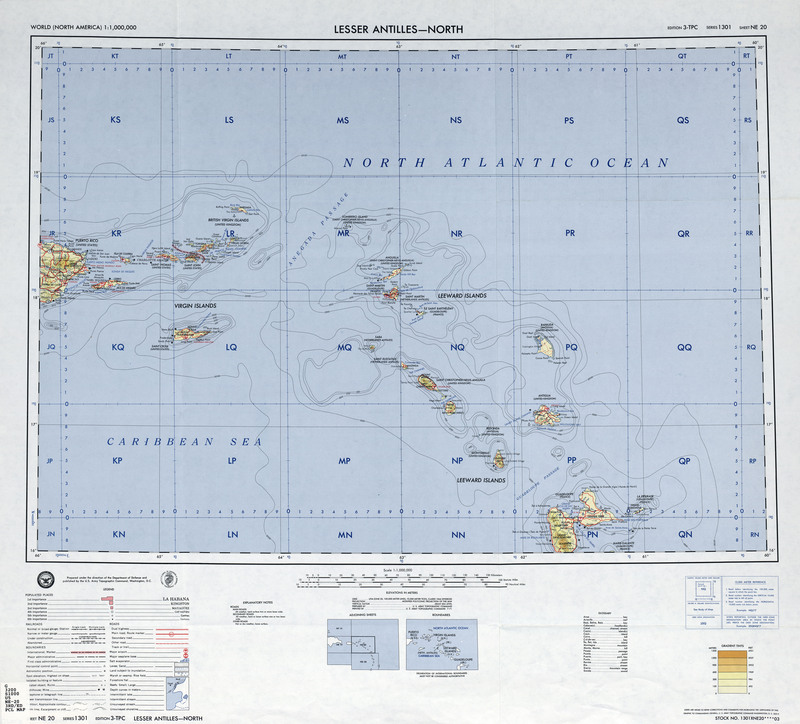 However, Nevis continued to be economically important, despite its diminutive size and reduced administrative function. As relations between Britain and France deteriorated in the Seventeenth and Eighteenth Centuries, so the clashes between the ships of the two nations occurred in and around the Leeward Islands Colony. From their bases on St. Kitts, the French launched a number of attacks towards Nevis. 1706 saw a concerted attack by the French under, Pierre Le Moyne d'Iberville. The English militia failed to halt the invasion and fled into the interior. The rampaging and pillaging French attempted to gather up much of the slave workforce to sell off for prize money in Martinique. Many of the slaves fought back to protect their families and the only homes they knew. Such was the ferocity of this fighting that the French finally withdrew from the island after 18 days of fighting. One consequence of this invasion was the collapse in the economy of the island due to the destruction of the plantations and infrastructure and the capture of a significant portion of the workforce. 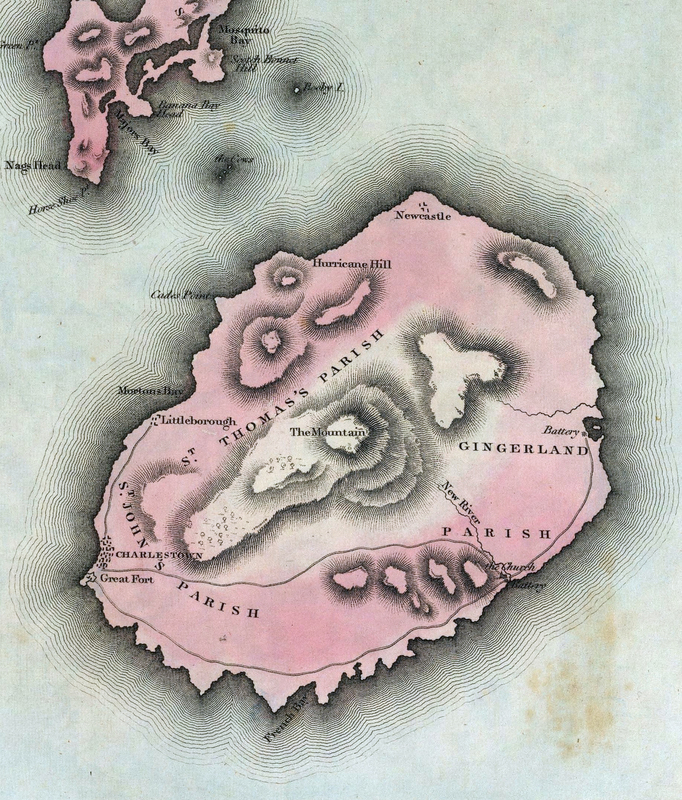 The island underwent a period of profound famine and hunger. One solution, that was to have lasting consequences, was that surviving slave families were granted small plots of land to tend and grow crops of their own. They were still obliged to work under very severe conditions for their European owners, but the smallholdings would play an important part in the economy and livelihoods of the slaves who could tailor their crops and diets more appropriately and gain a semblance of self-sufficiency and dignity. Sugar was still the dominant plantation crop in the Eighteenth Century and the rise of the 13 Colonies on the Atlantic seaboard provided new markets to sell to. The Southern Colonies also provided new markets for the slave traders. Antagonism with the French did not abate as both the Austrian War of Succession from 1740 to 1748 and the Seven Years War of 1756 - 1763 saw the Caribbean become a battleground for the French and British fleets once again. The rise in the skill and power of the Royal Navy meant that the British were becoming more successful at holding their ground and capturing nearby French islands using Nevis as an important victualling port and safe harbour. The island opened its first hotel in 1778. It was the first such establishment in the Western Hemisphere. The Bath Hotel was constructed over the site of one of the island's hot springs. The island thus became the first place in the Americas to officially practice tourism. 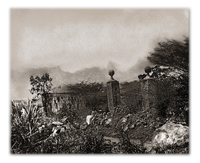 Nevis's popularity as a destination would eventually grow, but the timing of the opening of the hotel was less than perfect as the American War of Independence was in danger of spilling beyond the borders of the 13 colonies. The American Wars of Independence were to be more challenging to the island economy as a combined American, French and Spanish effort against the British saw the island cut off for long periods of time. 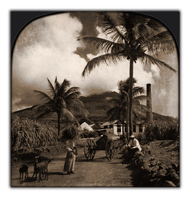 Unable to sell its wares and unable to import foodstuffs, the plantation economy showed its lack of resiliance and once again famine and hunger stalked the island. In 1782 the island surrendered to the French without a firing a shot in defence. A large French fleet under Admiral de Grasse was en route to St. Kitts to root out the British there and saw the opportunity to seize the weakened island of Nevis. Fortunately, the war was drawing to a close and it was soon returned to British control by the Treaty of Paris ending the War of Independence in 1783. Interestingly, a certain young Captain Horatio Nelson was based on Nevis in the 1780s and married the widow of a plantation owner there by the name of Frances Nisbet. It was common for Royal Naval personnel to spend long periods of time in the Caribbean. It was an all too familiar battleground. Barely a decade had elapsed until the British and French were once again fighting each other in the Revolutionary and Napoleonic Wars. 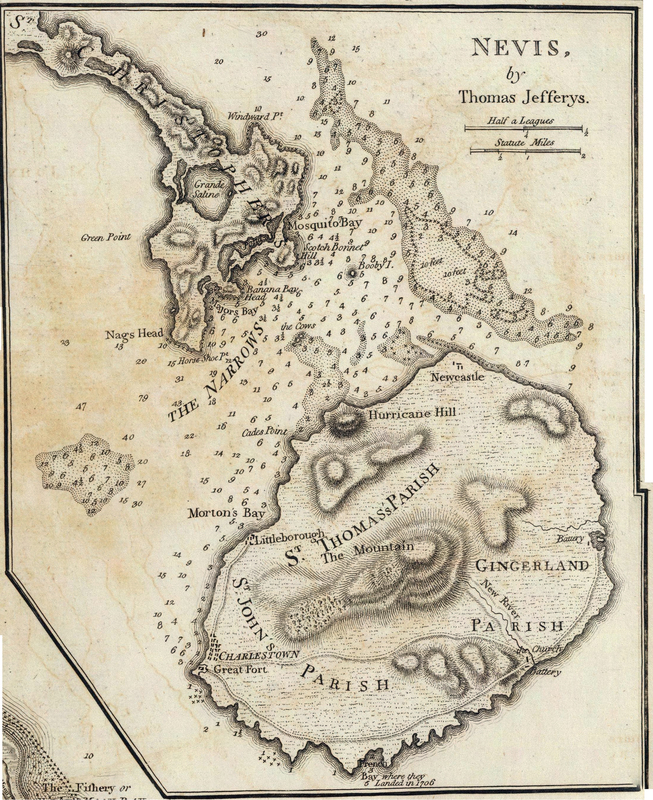 Once more the sugar islands of the Caribbean became a major theatre of operations. It was complicated by the fact that slave revolts in Haiti raised tensions amongst the aristocratic elites on other sugar islands who were concerned that some of the Revolutionary ideas from Europe might spill over into the slave economies. The French assaulted the island twice in both 1805 and 1806 under the direction of Napoleon's youngest brother, Jerome Bonaparte. Both of these were repulsed with the enhanced defences of Fort Charles playing a prominent role. An unexpected breakthrough for the anti-slave trade campaigners back in Britain saw the abolition of the Slave Trade in 1807 at the height of the Napoleonic wars. There was actually strategic reasoning behind its abolition in that it gave Royal Naval ships an excuse to search foreign vessels who might be trying to trade with France or her allies. However, the consequences for the sugar islands would be profound as the supply of cheap replacement labour from Africa was cut off. Slaves could still be bought and sold but could only be raised from the existing stock within the Caribbean. The Napoleonic Wars would offer another profound threat to the sugar island economies. Namely, the introduction of sugar beet as a replacement for sugar cane. Unable to break the British blockade, the French sought a replacement for sugar and found that sugar beet could be grown in Europe and processed to make sugar also. It took a few years for the rest of Europe to follow France's lead, but within the first few decades of the Nineteenth Century, the price of sugar was collapsing and the sugar islands were losing their monopoly on sweetness. 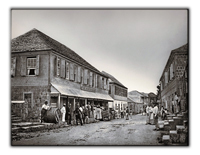 The abolition of slavery throughout the British Empire in 1834 again transformed the island economy. Compensation was paid to the owners for their loss of property but not to the slaves for being forced to work under such harsh conditions for so long. A system of apprenticeship was introduced to try and keep a plantation system going but this was little more than slavery in another form. The apprenticeship system itself was abolished in 1838 and the island reverted to a free labour system as laissez Faire ideals became increasingly common around the Empire. Unfortunately for Nevis, its heyday was well and truly over although this was largely due to the collapse in the value of sugar. It no longer commanded the prices it once held on the trading floors of London and New York. 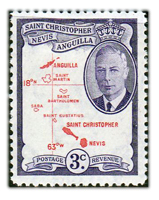 Nevis was formally united with its neighbour St. Kitts and Anguilla in 1882 within the Federal Colony of the British Leeward Islands. It was no longer a colony in its own right. This arrangement lasted until 1956. It finally gained its independence as part of St. Kitts in 1967. Winifred K. O'Mahony explains what it was like to live in the Leeward Islands in the 1930s as her husband was sent there to work as a supernumerary medical office. 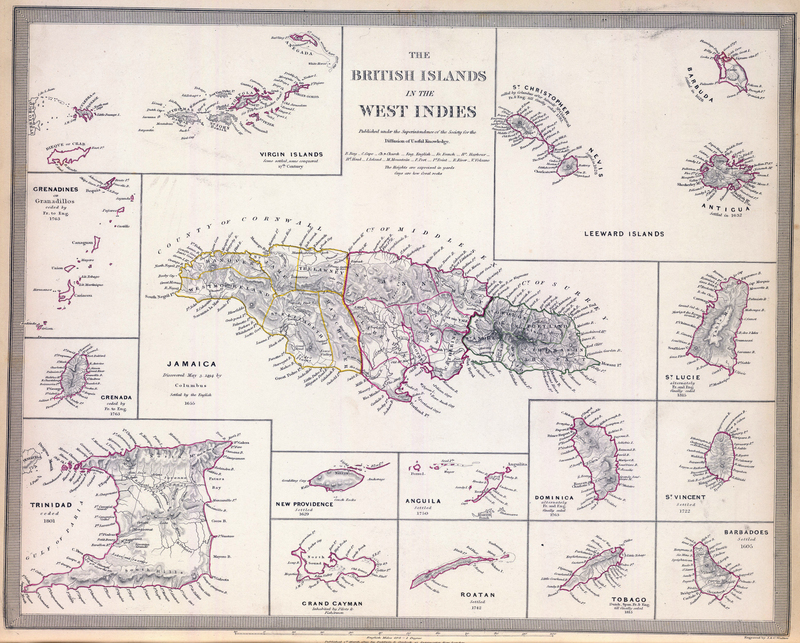 This had the side-effect of the couple being posted all over the chain of islands and experience Caribbean life from a multitude of angles in a fascinating period of its development.